Hand-crafted from solid oak, it keeps jam essentials handy and handsomely displayed. 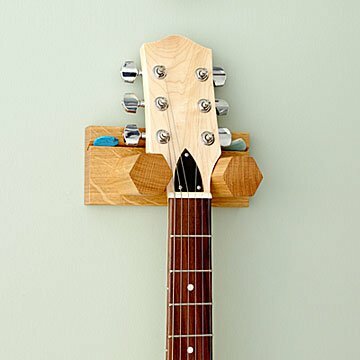 Whether you're more of a strummer or a shredder, consider this solid oak guitar holder your own personal roadie. It keeps a six string (or Flying V) handy and handsomely displayed, with a cleverly designed inlay for picks. The columns are adjustable, so even your ukulele can stay snug between luaus. Handmade by Gafyn Owen and Sean Nelson in Wales, which produced both Badfinger and Tom Jones. After meeting and studying product design at college together, Gafyn Owen and Sean Nelson went their separate ways, working as professional designers. Fifteen years later, they were reunited and started developing unique, hand-finished gifts together. Taking inspiration from the beautiful Welsh landscape, art, and current trends, they’ve developed their own style of functional products: clean, simple designs that are lovingly built to last. 7.1" L x 3.15" W x 3.74" H; Gap between posts can be adjusted: 1 5/8" - 2 3/8"
Recommended use with symmetrical guitar head to ensure secure hanging.